The UB Department of Theatre and Dance is still seeking deck(stage)/fly crew for their production of “Pippin” this October. This is a 2-credit opportunity within the 2nd 7-week course TH235, so the add/drop date is not until next month. It also counts for Honors Experience credit, and it is a fulfilling way to potentially give your GPA a boost. Attendance is 100% mandatory for this course, so please check your schedules meticulously to make sure you are available for all calls for this show before proceeding. However, there may be some exceptions on a case-by-case basis for minor scheduling conflicts, so please reach out if you think you may still qualify. There are 2 “on school time” performances, but you will receive as many excusal letters as needed for those two mornings, which are the same types of letters the athletes use for away games. The required dates and times are listed at the bottom of this message. Please let me know if you have any questions about registration, scheduling, responsibilities, or anything else you may think of. If you are interested, please email me at hswollan@buffalo.edu with your name, major, and a brief description of any prior theatre experience you have, including whether you’ve taken TH106. Fall themed Photo Boooth, Pot and Pumpkin Painting, FREE Tote Bags while supplies last, Variet of Off-Campus Vendors and Fresh Produce ($5 vouchers to the first 100 people)! 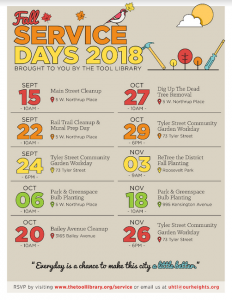 Join the Tool Library and community partners for a whole calendar of service events taking place in the University District this fall. From planting trees to fighting blight, there’s lots of ways to make an impact in your community! Join us to celebrate innovation and creativity at UB’s second annual Entrepreneurs Festival hosted by Blackstone LaunchPad powered by Techstars. The festival, a FREE 3-day event is designed to empower UB students, faculty, and staff to infuse economic development and innovation into the WNY region. 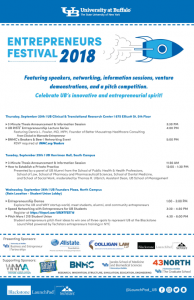 Programs will be hosted across all three of UB’s campuses, and will feature speakers and venture demonstrations, as well as a Pitch Wars competition to conclude the festival. The Entrepreneurs Festival will begin on Thursday, September 20th, with events through Wednesday, September 26th. 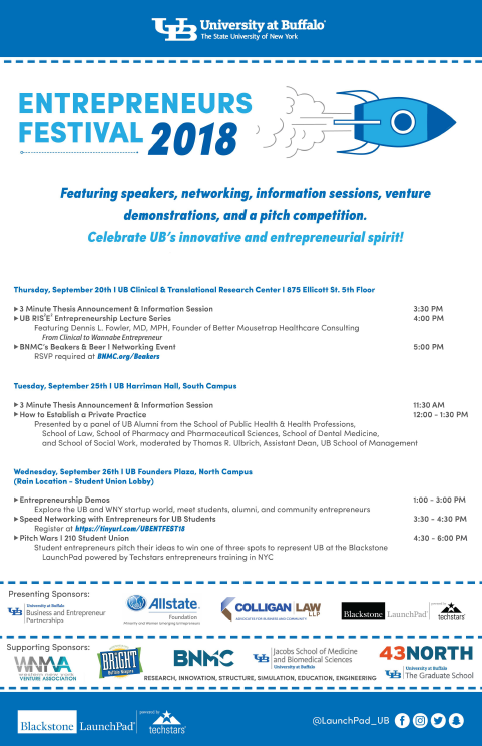 A full listing of events follows and listed in UB Now: http://www.buffalo.edu/ubnow/stories/2018/09/entrepreneurs-festival.html. Learn how to live sustainably from organizations and businesses from all over Western New York. Join us on Monday, September 24 from 10:30 am – 1:30 pm in the Student Union. Words have power! Celebrate the freedom to read and help draw attention to the issues surrounding censorship. Sign up to read a short selection from your favorite banned or challenged book at a Read-Out in recognition of the American Library Association’s Banned Books Week 2018. Everyone is welcome! Register in advance, or come to the Lockwood Library Lobby on Sept. 26th and sign up the same day. The first 25 people to sign up will receive a certificate for a free beverage from Whispers Café! Join us for a free film screening of the 1966 adaptation of Ray Bradbury’s classic novel, Fahrenheit 451. Help our garden grow and break the cycle of domestic violence. Come volunteer with Science is Elementary! Want to learn more or volunteer??? will operate under Thursday’s schedule. Amazing as always! Very helpful and patient. Great help, explained everything very well, left room with confidence! We are OPEN 10:00 am to 6:00 pm, Monday thru Thursday – stop by! We help with quiz/test, homework questions. JUST DROP IN – NO APPOINTMENT NEEDED!